For years I've pestered Google about a problem with its map, mainly because I have far too much time on my hands, but also because I live on the street that Google Maps refuses to correctly name. So below, here's how Google Maps shows the intersection of Whit Davis Road and Pettit Lane on Athens scenic eastside. You see Google insists it's Pettits Lane (you may have to click on the image to see it well). Google can't be wrong, right? Of course not, unless of course you use street view on Google Maps and see the following with the street sign, via street view, spelling the name correctly. Still using Google Maps, here's another bit of evidence below. 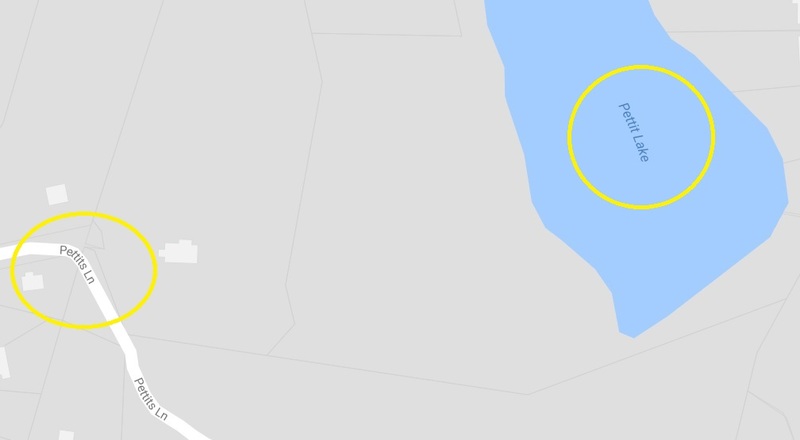 The lake is spelled correctly on Google Maps, but the street is not. So Pettits Lane leads to Pettit Lake. Why do I care? I live on Greenbrier Way, the first left after you get onto PETTIT LANE. So multiple times a day I see the correct street spelling and every time I'm home and load Google Maps I see the incorrect street spelling, and this kind of stuff drives me batty. So, maybe the street sign is wrong? 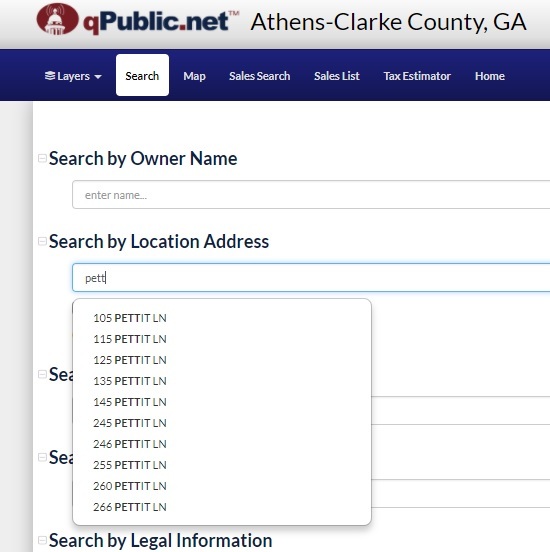 If you look at the Athens-Clarke County online property rolls, it's clearly Pettit Lane. See below. 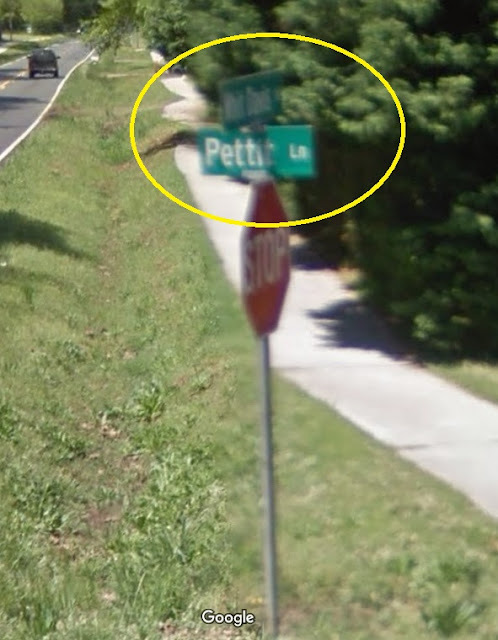 There is no Pettits Lane. Except, as far as Zillow is concerned, it's PETTITS LANE. So let's look up that first address listed above via the black magic of Zillow. So in some databases it's Pettits, but as far as the city-county is concerned, it's Pettit. So let's try one more test and use something I rarely use, Bing Maps. What's this all mean? That maybe I need something better to do with my time, and yes I've used Google Map's report feature to ask them to fix the street name, but nothing. Nada. I figured by including the Bing Map it may embarrass them enough to do something about it. Every so often I make an open records request for all open records requests from UGA (where I work as a journalism prof). It's a great teaching tool for students, showing them the kind of things that get requested. I just finished using it in one class and will use it in another class later this week, but I thought I'd share some of the findings. Yes, I've written about previous searches. Go look for them if you like. First, these are all open records requests this calendar year, ending with (obviously) my request for these records. There were 296 request so far this year. That's a lot of requests. The winner, yet again, are those pesky sports reporters. Out of 296 total requests, 127 (42.9 percent) involved athletics. Here are the Top 5 in terms of where the requests were funneled. Notice the huge drop from #1 to #2, and after #5 we hit the single digits. By the way, The R&B is high on the list as well. Now let's look at the top folks keeping our open records people busy (a good thing, in my book, as I teach a class in finding and using public documents). As you'd expect, sports dominates the list, usually requests for coaches contracts, stuff like that. North American Procurement Council (6 requests, no idea). OK, that last one. What the hell, right? It's a real thing, has a web page and all. What kind of stuff are they asking for? A copy of "plan-holders for the Chillder replacement at Terrell Hall at UGA" and a copy of "the list of plan-holders of the Blueberry Reserach Building at UGA" and stuff like that. No, I don't have a clue, but ever request asks for the "plan holders" and I don't even know what that means. And there are odd requests, sometimes good enough to be a story, but most not, like a list of all pecan growers in Georgia. So I was leaving the journalism building a week or so ago and noticed this. The physical boxes around campus are gone, but we have an exciting new update about the readership program coming soon (hopefully early next week). Stay tuned on our social media to get the fastest update! Odds are it's part of some app or online rather than physical paper. Some of that can be done now, as you can tell from the SGA's info about the program, lifted and pasted below. For nearly 10 years, SGA has sponsored the New York Times/USA Today Collegiate Readership program, which provides students with free access to several national and local newspapers, including the New York Times, USA Today and the Athens-Banner Herald. Paper bins are in convenient locations across campus and in residence halls. 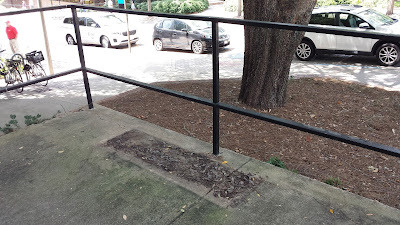 In order to access the bins, students need only to insert their UGA ID card into the reader display, opening the door and allowing them to take a paper. Since 2012, students have also been granted access to free web and app passes. Students go towww.nytimes.com/passes and sign up and then they are able to log in as often as every 24 hours to claim a pass. The number of passes allocated to the University is based on the number of physical papers students pick up out of the bins around campus, so as the Collegiate Readership Program increases in popularity, online access increases for all UGA students. How many guns do you or anyone else living here own? For the same of full transparency, I'd answer one. I've had it for years. The data is fascinating. Nearly two-thirds of 3,468 respondents who answered the question answered zero (actually, 65.7 percent). That means everyone else has a gun, but how many? Like me, more answered one gun than any other response (10.2 percent), followed by two guns (7.3 percent), and so on. Like a lot of surveys, you get weird answers as well. Two people said they own 50 guns and one person reported owning 99 guns. That's a lot of guns, except I'm willing to bet it was a survey response tossed off with little or no thought. I suspect they own a lot, but even to me 99 seems unlikely. Twenty, yeah. Ninety-nine? Not so much. For fun, let's treat this question as an interval-level variable and correlate it with certain other variables. You know, stuff like age, education, and political ideology. Below are some results. Slight positive relationship, older equals more guns. Barely. Same as above for income. There, but not strong. The more you identify with the GOP, the more guns ya own. Ditto to above for being more conservative. We could go on and on with this, correlating this with a jillion variables available in the data, but I doubt we'd be surprised by the basic results. There was also a slight positive relationship with how many guns you own and how satisfied you are with democracy (r = .04, p<.01) and how fair you felt the 2016 election was (r = .07, p<.001). That's comforting, knowing the gun fans are happy. From a media standpoint, it's no surprise that there's a small but significant correlation between how many guns you own and watching Fox News hosts Sean Hannity (r=.08, p<.001) and Bill O'Reilly (still on the air in '16, r = .09, p<.001). No relationship with watching Anderson Cooper or Chris Matthews. A more useful analysis, to be honest, is recoding that gun question so it has two levels -- don't own a gun, or do. Really the number of guns measures those who hunt, in which it's not unusual to have several guns depending on the kind of hunting you're doing at that time. Friday afternoons are for doing stuff I shouldn't be doing and not doing the stuff I should be doing. In other words, I'm playing around with data -- this time UGA data on payments it made to various vendors. And by various, I mean 27,196 vendors listed in the 2016 fiscal year (data for the 2017 fiscal year, which ended in June, isn't available yet). There's not much here, just the name of the vendor, the total payment for the fiscal year, and the number of payments made. With no explanation whatsoever, here are the Top Ten and their amounts. I'll comment briefly below the list. Numbers are rounded to preserve my sanity. A few notes about above. Payroll is #1, that's no surprise, and a lot of the others appear to be construction costs or payments to to the research foundation or for the electricity that keeps me cool in the summer and warm in the winter. Fun things I found. Jittery Joe's received a $68,799.86 payment. I'm a fan. You can't pay them enough. Chick-fil-A got $112,157.36. Oh, and for you chip lovers out there, $155,956.76 was paid to Frito Lay. With so many payments, a lot of them are weird looking but normal stuff for a university this size. Here's one -- Versus Spa. That one got my journalism spidey senses tingling but it turns out that $114,864.90 went to a routine company that has nothing to do with spas. Oh, and Homeland Security received $110,235 from us. No idea why. Yes, I checked for myself. I'm not in there, though there are a lot of individuals listed, mostly small amounts.